Best suited for a couple or family with a couple of children. DONT FORGET TO ASK ABOUT SPECIALS ON LAST MINUTE BOOKINGS!!! Owner and operator of Oak Grove Cabins in Franklin for the past 20 years. Loves the Great Smoky Mountain area and our amazing town of Franklin. 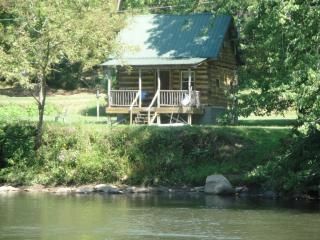 Enjoys offering Riverfront cabins to guests from all over the East and West Coast. Glory Days is such a unique restored original log cabin from the 1860s. It is one of a kind. Originally from a farm in West Virginia. It is full of character and style.It is located right on the banks of The Little Tennessee River and its surrounding grounds will remind you of what a little peace of Heaven could look like .Its a place where one can rest and recharge and come away planning their next visit. Close to the mines and most Smoky Mountain Attractions. One of a kind unique experience. Not like any other cabins in the area. Step back in time .Riverfront and River access. Very Peaceful and quaint. Put the cell phone down and get to enjoy the ones you love. Re connect back with Life and Nature and be blessed. On the bank of The Little Tennessee River. Fully furnished in Americana decor with everything you will need for a great vacation. Sat TV,DVD player,gas logs,full kitchen,linens, starter paper products,porch with swing and rockers, charcoal grill, picnic table, game room with pool table across the road,washer and dryer,a/c. fans,fishing rod rentals firepit for late night roasting marshmallows under the stars,HIGH SPEED WIFI Internet on premises. Clean, quiet and peaceful.! Very relaxing weekend. Cabin is beautiful. Everything you need is provided. Only complaint is the grass needed to be mowed. We will definitely be back! Neat cabin! Exactly what I expected from the pictures and description on the website. I'll would definitely like to visit again or rent an adjacent cabin. Thank you making my booking so easy! Not as great as expected. Cabin was too little for 4 guests. Should have kept it for 2 guests only. The heater sends the heat upstairs and we felt very hard to sleep even after a few hours of switching off the heater. Hot water was stinking with Lead and TV was not available in our 2 day stay (DirecTV did not work even after the rain stopped). Wifi was very slow and got disconnected frequently. 2 Stars for the location by the creek. So sorry that you didnt have a great time. Very hard to believe as most of our guests are 5 stars. We have a welcome book that gives you info on the gas logs. They are thermosted and we had them set when you arrived. When we came to clean the cabin we found the gas logs at 90 degrees. You wonder why you were hot. Yes, the heat goes up and keeps the bedroom warm in the winter. However the thermostat shuts it off when it gets too hot. You spoke to me on the phone 2 x with questions I am surprised that you didn't call us or stop by our office with your issues. we have done all we could to take care of them quickly. By the way. You and whoever in your group left the cabin a terrible terrible mess, and we sent over your rating as well for other land owners to review. So enjoyed my recent stay! The cabin was cozy and was equipped with everything needed. Very authentic with a true rustic feel. The porch was a perfect location to sit and watch the sun rise. The view of the sun bouncing off of the water was breathtaking. It was so peaceful to sit and watch the river flow. The fire pit was great as well! Located just a short drive from town. Hope to visit again! Thank you so much for staying at Glory Days! We are so glad that you enjoyed your stay. When our guests are happy we just love it! Please come back again. It was a pleasure to have you stay. We loved our stay in this charming cabin. It was fun being able to turn back time and live as they did in the 1800’s but with modern time amenities like running water, electricity and heat! Was glamping at it’s finest. My family loved fishing, camp fire, front porch, and the overall charm! Thank you so much Shara! I am so so glad that you and your family enjoyed the cabin. Please come back again. It was a delight to have you all stay at Glory Days!! Our overall experience is very positive. We did bring our 2 year old son, who kept wanting to jump into the river (which was up during our stay due to hurricane Michael), until naturally, when we built a fire and then he wanted to go inside to climb the stairs! The bathroom was a new experience for us, being so tiny, but it just added to the character of the place! Especially seeing a little head pop under the door! Only thing I might recommend is adding a shower head. We are novices when it comes to gas appliances, and working satellite tv remotes, so maybe add some simple instructions on these kind of things. (We were nervous about the fireplace and couldn't figure out the dvd player). But as I said, these are very minor things. We loved our overall experience. Beautiful location, beautiful weather, and beautiful cabin. Loved the old glory decor. We definitely plan on returning (maybe childless)! Thank you so much for the great review! Im sure it wasn't the easiest to be able to sit and relax near the river with a toddler! Even though it sounds like you did pretty well. Not sure if you seen them but the directions for the gas logs are in the welcome book. It could be tricky if your not used to using propane. I sure do hope that you can come back again. We have many families who come back yearly and the children get to enjoy the cabin as they get older.Its a great place to make memories! Private but not remote. Easily accessable to most Smoky Mt attractions.GEM MINING ( 5 minutes to 5 major gem mines),swimming, fishing, biking, horseback riding,rafting and tubing,Smoky Mt Railroad,Harrahs casino,Cherokee Indian Reservation,Smoky Mt Parkway, hiking and trails.Fine and casual dining, antique shopping, craft fairs and so much more.